Markers Enabling this option includes X/Y/Z reconstructed 3D positions for each marker in exported CSV files. Enableing this option includes tracking data of all of the unlabeled makers to the exported CSV file along with other labeled markers. If you just want to view the labeled marker data, you can turn off this export setting. Quality Statistics Adds a column of Error per marker values for each rigid body position data. Adds a column of Marker quality values after each rigid body marker data. Rigid Bodies When this option is set to true, exported CSV file will contain 6 Degree of Freedom (6 DoF) data for each rigid body from the Take. 6 DoF data contain orientations (pitch,roll, and yaw in the chosen rotation type as well as 3D positions (x,y,z) of the rigid body center. RigidBodyMarkers Enabling this option includes 3D position data for each expected marker locations (not actual marker location) of rigid body assets. Compared to the positions of the reconstructed marker positions included within the Markers columns, the Rigid Body Markers show the solved positions of the markers as affected by the rigid body tracking but not affected by occlusions. 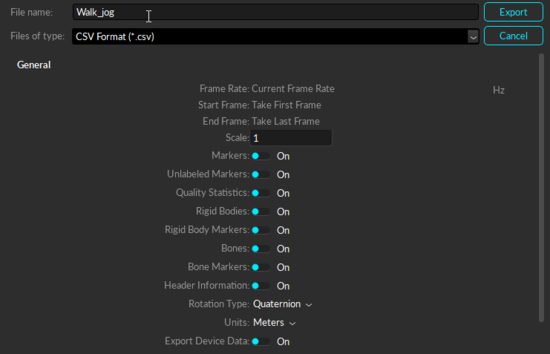 Bones When this option is set to true, exported CSV files will include 6 DoF data for each bone segment of skeletons in exported Takes. 6 DoF data contain orientations (pitch, roll, and yaw) in the chosen rotation type, and also 3D positions (x,y,z) for the center of the bone. BoneMarkers Enabling this option will include 3D position data for each expected marker locations (not actual marker location) of bone segments in skeleton assets. Compared to the real marker positions included within the Markers column, the Bone Markers show the solved positions of the markers as affected by the skeleton tracking but not affected by occlusions. Header information Includes detailed information about capture data as a header in exported CSV files. Types of information included in the header section is listed in the following section. Rotation Type Rotation type determines whether Quaternion or Euler Angles is used for orientation convention in exported CSV files. For Euler rotation, right-handed coordinate system is used and all different orders (XYZ, XZY, YXZ, YZX, ZXY, ZYX) of elemental rotation is available. More specifically, the XYZ order indicates pitch is degree about the X axis, yaw is degree about the Y axis, and roll is degree about the Z axis. Export Device Data When set to True, separate CSV files for recorded device data will be exported. This includes force plate data and analog data from NI-DAQ devices. A CSV file will be exported for each device included in the Take. Use World Coordinates This option decides whether exported data will be based on world(global) or local coordinate systems. Global: Defines the position and orientation in respect to the global coordinate system of the calibrated capture volume. The global coordinate system is the origin of the ground plane which was set with a calibration square during Calibration process. Local: Defines the bone segment position and orientation in respect to the coordinate system of the parent segment. Note that the hip of the skeleton is always the top-most parent of the segment hierarchy. Local coordinate axes can be set to visible from Application Settings or display properties of assets in Project Pane. The Bone segment rotation values in the Local coordinate space can be used to roughly represent the joint angles; however, for precise analysis, joint angles should be computed through a biomechanical analysis software using the exported capture data (C3D). The quality stats display the reliability of associated marker data. Errors per marker lists average displacement between detected markers and expected marker locations within corresponding assets. Marker Quality values rate how well camera rays converged when the respective marker was reconstructed. The value varies from 0 (unstable marker) to 1 (accurate marker). When the header is disabled, this information will be excluded from the CSV files. Instead, the file will have frame IDs in the first column, time data on the second column, and the corresponding mocap data in the remaining columns. 1st row General information about the Take and export settings. Included information are: format version of the CSV export, name of the TAK file, the captured frame rate, the export frame rate, capture start time, number of total frames, rotation type, length units, and coordinate space type. 3rd row Displays which data type is listed in each corresponding column. Data types include raw marker, rigid body, rigid body marker, bone, bone marker, or unlabeled marker. Read more about Marker Types. 4th row Includes marker or asset labels for each corresponding data set. 5th row Displays marker ID. 6th and 7th row Includes header label on which data is included in the column: position and orientation on X/Y/Z. When there is an occlusion in a marker, the CSV file will contain blank cells. This can interfere when running a script to process the CSV data. It is recommended to optimize the system setup to reduce occlusions. To omit unnecessary frame ranges with frequent marker occlusions, select the frame range with the most complete tracking results. Another solution to this is to use Fill Gaps to interpolate missing trajectories in post-processing. For Takes containing force plates (AMTI or Bertec) or data acquisition (NI-DAQ) devices, additional CSV files will be exported for each connected device. For example, if you have two force plates and a NI-DAQ device in the setup, total 4 CSV files will be saved when you export the tracking data from Motive. Each of the exported CSV files will contain basic properties and settings at its header, including device information and sample counts. Also, mocap frame rate to device sampling rate ratio is included since force plate and analog data are sampled at higher sampling rates. Force Plate Data: Each of the force plate CSV files will contain basic properties such as platform dimensions and mechanical-to-electrical center offset values. The mocap frame number, force plate sample number, forces (Fx/Fy/Fz), moments (Mx, My, Mz), and location of the center of pressure (Cx, Cy, Cz) will be listed below the header. Analog Data: Each of the analog data CSV files contains analog voltages from each configured channel. This page was last modified on 26 July 2018, at 01:44.